Dupain said of his day at Manly beach 'Actions like this have to be anticipated; in this case by me standing out in the surf with camera and waiting for the start. One shot only - I had to be lucky and I was (Dupain 1986)'. An earlier scene by Dupain, 'Manly' 1938 (Newton 1980) shows an objective aerial shot of swimmers enjoying the day but in 'Surf race start' Dupain partakes of the action as the male lifesavers step high through the waves as they challenge themselves against nature and each other to run then swim the course. The image reclaims the archetypal Australian male, the iconic surf lifesaver - a being threatened during World War II as images of dead and mutilated men began to appear, a reminder of the horrors of World War I. As President Theodore Roosevelt said, a nation was only as strong as its men. 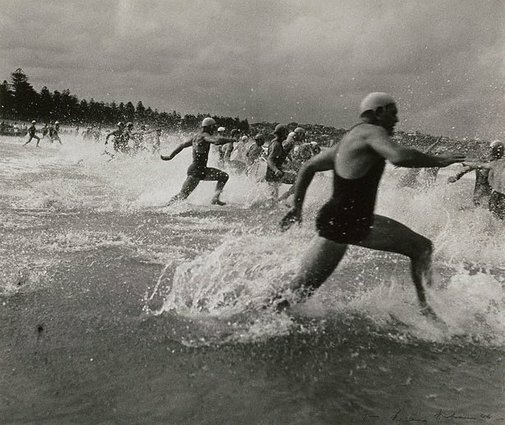 Far from the battlefields 'Surf race start' celebrates freedom, health and vigour through heroic masculine action in sport. The sloping land points in the direction the swimmers are headed as the two main figures with similar costume, body shape and stride intensify the composition, reminiscent of classical sculptural form. Signed and dated l.r. image and u.c. verso original board, pencil "Max Dupain '46". Celebrating Paradise - The artist and the Northern Beaches: 1890 to 2000 , Manly, 1999, 20.